A modifier is a word/phrase/clause which modifies other words in a sentence. To be specific, a modifier is either an adjective or an adverb. The adjectives modify the nouns, and the adverbs modify the verbs or the adjectives or the other adverbs. See the details of adjectives and adverbs. Alex bought a chocolate cake yesterday. Murphy, the president’s daughter, is very sick. The brown(adjective) dog was barking at me aggressively(adverb). 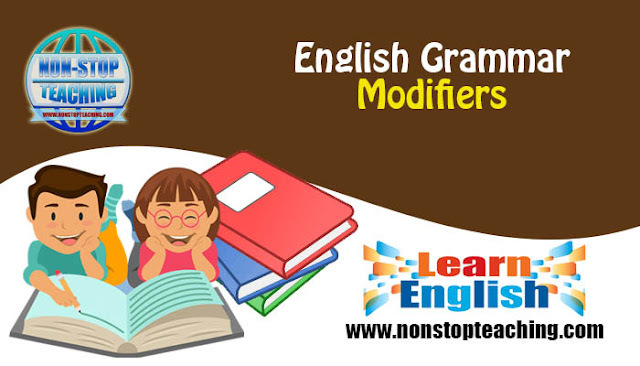 Pre-modifiers are the modifiers which modify the words that follow them in the sentence. Conventionally the adjectives are usually placed before the nouns. So, most of the adjectives are pre-modifiers. Adverbs are often placed before the words they modify. Articles, determiners, demonstratives, proper adjectives, descriptive adjectives, compound adjectives, participles, etc. are the adjectives which come before the nouns and modify them. Conjunctive adverbs, sentence adverbs, and some other adverbs can work being placed before the verbs/adjectives/other adverbs. Generally(adverb) the(article) brown(descriptive adjective)dogs are nice. Apparently(adverb), that(demonstrative) bank has a lot of(determiners) security(adjective) porcess. Give me that(demonstrative) black(descriptive adjective)covered(past participle) shining(present participle) box. Post-modifiers are the modifiers which come after the words they modify. Customarily, the adverbs come after the verbs and modify them. However, some adjectives also come after the nouns and modify them. Most of the adverbs of time, adverbs of manner, adverbs of place/direction usually come after the verbs they modify. Appositives, prepositional phrases (adjectives/adverbs), infinitives (adverbs/adjectives), dependent clause, etc. usually come after the nouns they modify. Jason Roy, a cricketer,(appositive) has been selected in the squad(adverb). Stark, our teacher, (appositive) gives us tasks to do(infinitive - adjective) in the class(adverb of place). Ronaldo, the captain of Portugal team,(appositive) plays exceptionally(adverb of manner) well.